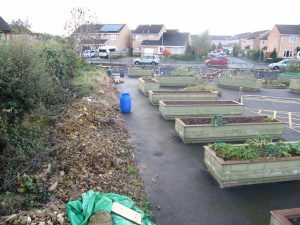 Westfield Allotments and Gardening Society (WAGS) pitched at our Dragons' Den 3 and were awarded £500 towards their Gardening For Children project – to create raised beds to encourage children to grow vegetables, fruit and flowers and develop an interest in allotment gardening for the future. ‘The project is in progress but has not been completed; however, the project was planned to continue over a 2-3 year period, as funding allowed. As you can see, it’s going to be an exciting project that will help WAGS to engage with the community and especially reach out to the next generation of green fingered gardeners! We just need to be patient whilst the beds are prepared. If you’re interested in getting involved with WAGS, using an allotment, or in learning more about how your children can benefit from the new raised beds, please get in touch with Alison Perry westfieldallotments@hotmail.co.uk who will be pleased to help. This entry was posted in Dragons' Den, Life Long Learning, People, Place. Bookmark the permalink. ← Dragons’ Den Success – SWALLOW members enjoy their Zumba classes!